Amestur acknowledged the quality work of the Riviera Nayarit’s Culinary Ambassador supporting culinary education, tourism and culture. 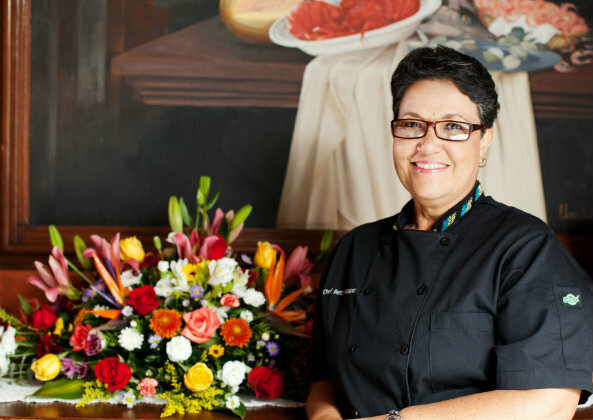 Chef Betty Vázquez, Culinary Ambassador to the Riviera Nayarit, has received the 2017 National Tourism Education Award given by the Mexican Association of Higher Education in Tourism and Gastronomy (Amestur, by its acronym in Spanish), based on an analysis of her professional tenure. The announcement was made by the president of the Advisory Committee and Dr. José Luis Isidor Cato, representative of the Amestur general assembly, who pointed out that the organism’s recognition committee took into account the high quality of the Nayarit-born chef’s activities in support of culinary education, tourism and national culture. “The union of tourism and gastronomy is something I’ve been working on forever with pride and enthusiasm, though sometimes it can almost be painful because enough isn’t done about it. Today my work brings me much satisfaction,” she commented. She will receive the award on October 12th at 9:30 a.m. at the Silver Center in the city of Zacatecas during the 6th International Conference on Touristic and Socio-Cultural Advancement. Betty Vázquez—a judge on the Mexican reality show, Master Chef—has a career that spans 37 years, and for the past decade or so she has championed the gastronomy of Nayarit. Her creations have brought her recognition from national and international entities; she has also been an active participant in festivals, conferences, seminars, publications and reality shows such as Master Chef México, and the guest of honor representing Mexican cuisine in different countries and festivals around the world. The Riviera Nayarit Convention and Visitors Bureau (CVB) would like to acknowledge Betty Vázquez’s important milestone, which is in itself recognizes the quality of the gastronomy visitors can enjoy while in Mexico’s Pacific Treasure.